Fueled by her passion to help others and her interest in social innovation, Sofia views every experience as a stepping stone in developing her capacity to improve our world. Her path in life is marked by rich experiences in different cultures and countries. After early years in New York and Peru, Sofia moved to Spain where she spent most of her childhood. She travelled extensively in Europe and her curiosity lead her to work and travel in Sierra Leone, Cambodia and Peru. After earning her BSc in Education at the University of Miami, Sofia worked at a variety of non-profits and social enterprises that sparked her interest in social entrepreneurship, responsible business and technology. 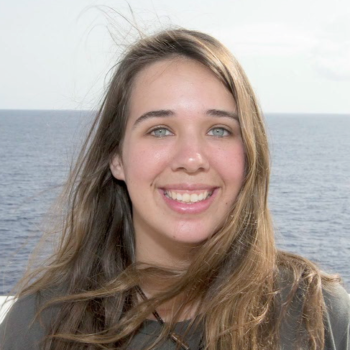 In 2015, she completed a semester-long journey aboard a shipboard campus (known as Semester at Sea) and travelled to 12 countries primarily in Asia and Africa. The voyage strengthened her love for art and culture- and helped her identify universal patterns while sharpening her view on today’s global challenges. Her recent work at Ashoka U (Washington, DC) which promotes social innovation in higher education, gave her an outstanding opportunity to work closely with an array of social entrepreneurs. Sofia’s hope is to continue building her skills, experience and friendships as she explores transformative solutions for the evermore complex challenges of the world.